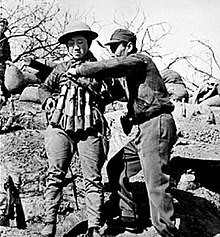 The Battle of Tai'erzhuang (Chinese: 台兒莊會戰; pinyin: Tái'érzhūang Huìzhàn) was a battle of the Second Sino-Japanese War in 1938, between the armies of the Republic of China and the Empire of Japan. The battle was the first major Chinese victory of the war. It humiliated the Japanese military and its reputation as an invincible force, while for the Chinese it represented a tremendous morale boost. By 1938, the Chinese military had suffered tremendous losses following the fall of Shanghai and Nanjing. In particular, its air force and navy had both been virtually wiped out. Nonetheless, China's resolve in resisting the Japanese invasion showed no signs of weakening. On 30 January, the Japanese military high command, after evaluating the situation in China, decided that no new offensive operations shall be conducted until August. Emperor Hirohito's stance was even more conservative: he believed that it would take at least a year for the Japanese to solidify their positions in their newly captured territory and consolidate their strength before conducting any further operations. Thus, the Japanese high command decided to wait until 1939 before conducting a swift, aggressive offensive in order to decisively end the war in China. At the same time, Chiang Kai-shek refused to accept the Japanese terms for surrender, publicly declaring: "From now on, the KMT government will not be open for negotiation (今後不以國民政府為談判對手)." On 20 February, China withdrew its ambassador Xu Shiying (zh:许世英) from Japan. The next day, Japan followed suit, withdrawing its ambassador Kawagoe Shigeru (ja:川越茂). Earlier that year, Chiang had also resigned from his post as Premier of the Executive Yuan, in order to fully dedicate his efforts to the war. The respective actions taken by both sides was indicative of their attitude towards the war: China was now fully committed, while Japan still showed some signs of hesitation. A significant proportion of the Chinese forces that withdrew from Shanghai crossed the Yangtze River northwards into the Jiangbei (zh:江北) region. During the retreat from Nanjing, many scattered Chinese troops also found themselves drifting down the Yangtze and into Jiangbei. The IJA saw this as an opportunity to pursue and destroy this cluster of disorganised Chinese troops, thus ignoring the IJN's strategy of following the Yangtze westwards. Throughout December 1937, Rippei Ogisu’s 13th Division pursued the fleeing Chinese forces, capturing Jiangdu (zh:江都), Shaobo (zh:邵伯), and advancing into Anhui to capture Tianchang (zh:天长). Simultaneously, in Northern China, Rensuke Isogai's 10th Division, advanced southwards between Qingcheng (zh:青城) and Jiyang (zh:济阳) to cross the Yellow River, approaching the Jiaoji railway. Gaining access to the railway would enable it to move westwards then southwards to clear the Jinpu railway and join forces with the 13th division at Xuzhou. From there, the combined Japanese forces could attack Wuhan and force the KMT into surrender. The war had thus moved from the 3rd to the 5th War Area. The Chinese 5th War Area was bordered by the Yellow River in the north, Yangtze River in the south, and Yellow Sea in the east. The area encompassed all of Shandong province, as well as parts of Anhui and Jiangsu. Its commander was Li Zongren (zh:李宗仁), and its deputy commanders were Li Pinxian (zh:李品仙) and Han Fuju (zh:韩复榘), the latter also being the chairman of Shandong. Despite having risen through the ranks and followed Chiang Kai-shek in the Second Northern Expedition, Han was unable to shake the habits of warlordism: seeking to preserve the strength of his forces, he disobeyed direct orders to defend the northern section of the Jinpu railway, withdrawing his force, the 3rd Army Group, westwards without ever engaging the Japanese. This opened up a large gap in the 5th War Area's northern region, allowing the Japanese 10th Division to capture Zhoucun (zh:周村). On the 27th, the Japanese captured Jinan (zh:济南), and in less than a week they had also captured Tai'an (zh:泰安). 13th Division, commanded by Rippei Ogisu, advancing northwards from Nanjing. 5th Division, commanded by Seishiro Itagaki, amphibiously landing at Qingdao, and advancing along the Taiwei Highway. 10th Division, commanded by Rensuke Isogai, advancing southwards from Hebei. An ancient city, Xuzhou was a hub linking together the four provinces of Jiangsu, Shandong, Henan, and Anhui. It was also a junction connecting the Longhai and Jinpu railways. The Grand Canal also ran adjacent to it, connecting the Yellow and Yangtze rivers. The city was also the cradle of Han culture, and, for thousands of years, had been a city of vital military importance, with more than 200 wars having been fought in its vicinity over the course of 4000 years. Capturing Xuzhou would allow the Japanese to advance westwards to attack Zhengzhou via the Longhai railway, and from there drive southwards to attack Wuhan via the Pinghan railway. At the time, the NRA 5th War Area lacked significant military strength. This was a serious issue given the vital importance of Xuzhou. Its commander, Li Zongren, was an old rival of Chiang Kai-shek. While they had become sworn brothers during the Northern Expedition, their intense rivalry quickly ignited almost immediately afterwards, culminating in the Central Plains War. Although their rivalry would never come to an end, they set it aside for the time-being to focus on the war effort against Japan, with Chiang sending his Vice Chief of Staff Bai Chongxi to Xuzhou in January 1938. Li and Bai were old comrades from the New Guangxi Clique, and had served alongside each other since the Battle of Longtan in the Northern Expedition. At the request of Bai, Chiang sent Li the 3rd War Area's 21st Army Group. Also a unit from Guangxi, the 21st was commanded by Liao Lei (zh:廖磊) and consisted of the 7th and 47th Corps. At this time, Sun Zhen's (zh:孙震) 22nd Army Group, a unit from the Sichuan clique also arrived at the Shanxi-Henan region, only to be rejected by both Yan Xishan (commander of the 2nd War Area and chairman of Shanxi) and Cheng Qian (commander of the 1st War Area and chairman of Henan). Both Yan and Cheng disliked units from Sichuan for their poor discipline, particularly their rampant opium consumption. During the 1930s, opium consumption was widespread in Sichuan and Yunnan. Furthermore, China's extreme poverty, which was substantially exacerbated by the Japanese invasion, meant that opium tax remained an important source of income for regional governments. Under the command of Sun Zhen, the 22nd Army Group had deployed four of its six divisions to assist the war effort in Northern China. Organised under the 41st and 45th corps, the contingent began its foot march towards Taiyuan on 1 September, marching for more than 50 days continuously and covering some 1400 kilometres. When they arrived in Shanxi they were confronted with an icy winter. Despite lacking winter uniforms or even a single map of the province, they immediately engaged the Japanese for 10 days at Yangquan (zh:阳泉), incurring heavy casualties. Desperately low on supplies, they broke into one of the Shanxi clique's supply depots, infuriating Yan Xishan, who expelled them from the province. The 22nd then withdrew westwards into the 1st War Area, only for its commander, Cheng Qian to reject its request for resupplies. At this time of desperation for the 22nd, Bai Chongxi asked Li Zongren whether he was willing to accept this Sichuan unit. Li responded by saying, "Back in the day, Zhuge Liang dared to even use straw soldiers to acquire arrows. Surely these Sichuan troops cannot be worse than straw soldiers. Give them to me." Thus, the 22nd gratefully entered Shandong, where it was deployed to the northern section of the Jinpu railway. With Sun Tongxuan's 3rd Army Group on its left flank, the 22nd faced the Japanese 10th Division, led by Rensuke Isogai at Tai'an. At the time, poor discipline that was commonplace amongst the Chinese Army's regional units, which were often hastily drafted and organised from bandit groups, and led by officers two thirds of whom were illiterate. Poor discipline also pervaded the higher ranks, with Han Fuju being an archetypal example. Seeking to stamp out this problem, Chiang conducted a military conference at Kaifeng on 11 January to produce a collective report on military discipline. Attending the conference were high ranking general officers from the 1st and 5th War Areas, including Han Fuju. After the conference, Han was arrested and detained in Wuhan. Under the direction of the director of military law, Tang Shengzhi, who had led the defense of Nanjing a year earlier, Han was sentenced to death and executed on the 24th, at the age of 49, making him the first Chinese high ranking general officer to have been executed in the war. Han's execution had a significant impact on military discipline throughout the Chinese Army. Matters discussed at the Kaifeng conference included not only wartime punishments, but also rewards. The NRA's system of rewards and punishments would be rigorously carried out until the end of the war. Sun Tongxuan succeeded Han as acting commander of the 3rd Army Group, whose later admirable performance during engagements along the northern section of the Jinpu railway would become a representative example of the impact of the NRA's re-organisation of military discipline. Han Deqin's (zh:韩德勤) was formed from the Jiangsu Peace Preservation Corps. Pang Bingxun's (zh:庞炳勋) 3rd Army and Zhang Zizhong's (zh:张自忠) 27th Army were from the Northwestern Army. Liao Lei's (zh:廖磊) 21st Army Group and Li Pinxian's (zh:李品仙) 11th Army Group were from the New Guangxi Clique. Yu Xuezhong's (zh:于学忠) 51st Corps was from the Northeastern Army. Sun Tongxuan's (zh:孙桐萱) 3rd Army Group was a unit from Shandong. Commanded by Rippei Ogisu, the Japanese 13th Division, drove westwards from Nanjing via two columns in early February: the northern column advanced towards Mingguang (zh:明光), while the southern column advanced towards Chuxian (zh:滁县). Both columns were checked by Wei Yunsong's (zh:韦云淞) 31st Corps, which had been tasked with defending the southern section of the Jinpu railway by Li Zongren. Despite facing a completely inferior enemy, the Japanese were unable to make any progress even after more than a month of continuous attacks. The Japanese then deployed armoured and artillery reinforcements from Nanjing. The Chinese responded by withdrawing westwards to the southwestern outskirts of Dingyuan (zh:定远) in order to avoid direct confrontation with their reinforced foes. By this time, Yu Xuezhong's (zh:于学忠)'s 51st Corps had already positioned itself defensively on the northern banks of the Huai River, forming a defensive line between Bengbu (zh:蚌埠) and Huaiyuan (zh:怀远). The Japanese proceeded to successively capture Mingguang, Dingyuan, and Bengbu before advancing towards Huaiyuan. However, their supply routes were then intercepted by the Chinese 31st Corps, which conducted flanking attacks from the southwest. The Japanese situation was worsened further when the Chinese 7th Corps (led by Liao Lei) then arrived at Hefei, reinforcing the 31st Corps. Engaged by three Chinese corps simultaneously, the Japanese were trapped south of the Huai River and unable to advance any further despite enjoying complete air superiority and having a complete advantage in firepower. The Chinese had thus foiled the Japanese plan of advancing their 13th Division northwards along the Jinpu railway and joining forces with Isogai Division (10th Division) to launch a pincer attack on Xuzhou. After amphibiously landing at Qingdao, the Japanese 5th Division (commanded by Seishiro Itagaki), advanced southwestwards along the Taiwei Highway, spearheaded by its 21st Infantry Brigade. There they faced the Chinese 3rd Army Group, commanded by Pang Bingxun. Despite being designated as an army group, Pang's unit only consisted of the 40th Corps, which itself only consisted of the 39th Division, a unit from the Northwestern Army. Led by division commander Ma Fawu (zh:马法五), the 39th's five regiments ended up delaying the Japanese advance towards Linyi (zh:临沂) for over a month. The Japanese captured Ju County (zh:莒县) on 22 February and pushed towards Linyi on 3 March. However, they were met by a stiff Chinese counterattack, which checked them at the Taoyuan (zh:桃园) region. The Japanese then conducted heavy aerial bombardment on the single Chinese division, forcing it to withdraw into Linyi. During this time, Zhang Zizhong's 59th Corps, also a Northwestern unit, had moved eastwards from Xuzhou along the Longhai railway, passing Taierzhuang before advancing northwards towards Linyi. It crossed the Yi River (zh:沂河) on 12 March and attacked the Japanese left flank, engaging them from 13 to 18 March, during which the 39th Division managed to push the Japanese out of the Linyi region. Pursued by the Chinese from two directions the Japanese were forced to withdraw, losing almost two entire battalions in the process. This engagement broke the myth of Japanese invincibility, and also humiliated Japanese commander Seishirō Itagaki, even shocking the IJA headquarters. Although the Japanese 5th Division later regrouped and tried again, it had lost the element of surprise. The Japanese defeat at Linyi at the hands of the inferiorly trained and equipped Chinese regional units set the scene for the eventual battle at Taierzhuang. Of the three Japanese divisions driving into the Chinese 5th War Area, the 10th Division, commanded by Rensuke Isogai, was the most successful. Setting out from Hebei, it crossed the Yellow River and moved southwards along the Jinpu railway. With KMT General Han Fuju having ordered his forces to desert their posts, the Japanese successfully captured Zhoucun and moved into Jinan without meeting any resistance at all. The Japanese then advanced southwards along two columns from Tai'an. The eastern column captured Mengyin (zh:蒙阴) before pushing westwards to capture Sishui (zh:泗水). The western column advanced south-westwards along the Jinpu railway, capturing Yanzhou (zh:兖州), Zouxian (zh:邹县), and Jining (zh:济宁), before driving north-westwards to capture Wenshang (zh:汶上). Chiang Kai-shek then ordered Li Zongren to utilise 'offensive defense' (攻势防御), i.e. seizing the initiative to actively attack, instead of passively defending. Thus, Li deployed Sun Zhen's 22nd Army Group to attack Zouxian from the south while Pang Bingxun's 40th Division advanced northwards along the 22nd's left flank to attack Mengyin and Sishui. Sun Tongxuan's 3rd Army Group also advanced from the south, launching a two-pronged attack on the Japanese at Jining. Fighting fiercely from 12 to 25 February, the respectable combat performance of the 12th Corps in particular helped to ameliorate the reputational damage that Han Fuju had otherwise inflicted upon on the Shandong units. The Japanese made some strategic changes as a result of these Chinese counterattacks: they cancelled their original plan of directly advancing westwards from Nanjing to Wuhan, so that more troops could be spared for the push towards Xuzhou. The Japanese engaged Sun Zhen's 22nd Army Group in more than 30 days of ferocious combat south of Zouxian, inflicting heavy casualties on the Chinese and forcing them to withdraw to Teng County on 15 March. Defense of the county itself was delegated to the 41st Corps' 122nd Division. Led by Wang Mingzhang (zh:王铭章), the 122nd was a division in name only - in reality it only consisted of seven companies. Even with the addition of scattered elements of the 45th Corps withdrawing from the Jiehe River (zh:界河 (独山湖)), its total strength was only a little over 2,000 men. A support group formed by citizens from Chengdu arrived at the County to support the troops from their hometown, gifting them a banner that read: "Children of Tianfu, Serve the country and resist the Japanese" (天府子弟 抗日报国). On 16 March, the Japanese deployed a force primarily composed of the Watanabe (濑谷) detachment to launch a three-pronged offensive on the county under the cover of heavy aerial and artillery bombardment. The Japanese successfully broke into the county the next day and began engaging the Chinese in house-to-house combat. By the afternoon, Chinese division commander Wang Mingzhang had suffered multiple gunshot wounds, and proceeded to commit suicide. Nonetheless, the Chinese still stubbornly held onto the county for two more days. By dusk on 19 March, the Chinese had suffered 1800 killed and 300 wounded. The remaining 300 wounded soldiers fought until they could no longer hold the line, before committing mass-suicide by grenades in order to avoid capture. While Teng County fell, the NRA Military Affairs Commission redeployed Sun Lianzhong's 2nd Army Group, a Northwestern unit, and Tang Enbo's 20th Army Group, a Central Army unit, from the 1st War Area to reinforce the 5th War Area. Noting that Northwestern units had been consistently capable at defensive combat, 5th War Area commander Li Zongren gave the responsibility of defending Tai'erzhuang to Sun Lianzhong, who stationed Chi Fengcheng's 31st Division inside the district. The 85th Corps moved eastwards to Xuzhou from Shangqiu along the Longhai railway, before advancing northwards via the Jinpu railway to arrive at Lincheng (zh:临城), where it immediately engaged the Japanese pressing southwards from Teng County. While the series of engagements up to this point had resulted in the Japanese suffering some losses, ultimately the overwhelming disparity in weapons and equipment had left the Chinese with no option but to form line after line of near-suicidal resistance in successive desperate attempts to delay the Japanese advance. The Japanese utilised their devastatingly superior firepower and mobility to destroy the Chinese lines of resistance one after another, eventually capturing Yi County (zh:峄县) and Zaozhuang (zh:枣庄) by mid-March after two days of fierce combat. Tang Enbo requested Chiang Kai-shek for permission to send forth the 52nd Corps, which had been stationed at Boxian (zh:亳县). Chiang complied, and the 52nd moved eastward along the Longhai railway, passing Xuzhou and arriving at Taierzhuang, before advancing northwards past Yi County to attack Zaozhuang. The Chinese suffered heavy casualties here. For example, 2nd Division veteran Wang Jialin (王嘉琳) recalled in an interview in 1995 that out of his entire company, only 10 soldiers survived. Unwilling to risk losing the Central Army's elite divisions, Li Zongren withdrew both the 85th and 52nd Corps from their head-on engagements with the Japanese. Li believed it was better to instead open up a route for the Japanese to drive southwards into Tai'erzhuang, because, as long as Chi Fengcheng's 31st Division could hold onto the district, Tang Enbo's 20th Army Group could then manoeuvre around the rear of the Japanese forces to encircle them and give the Chinese the upper hand. Rensuke Isogai's 10th Division was not actually supposed to have driven deep into enemy territory and attack Tai'erzhuang alone. Rather, it was supposed to have waited for Rippei Ogisu's 13th Division to close in on Xuzhou and Itagaki Seishiro's 5th Division to pass Linyi for additional security. However, Isogai was confident enough in his forces, and planned to take out Tai'erzhuang in a single swift blow to complete the objective of clearing the Jinpu railway. Thus, he continued advancing his force southwards towards the district. Seeing the Japanese 10th Division continuing to press forward, Tang Enbo ordered Chi Fengcheng to send out a small force to the north and attack them and lure them into Tai’erzhuang. This plan of baiting the Japanese into the district was successful, and Isogai deployed 40,000 troops and around 80 tanks to attack Tai'erzhuang from the north. Beginning on 21 March, the Japanese Air Force launched an extensive bombing operation on the Chinese positions, forcing the civilians to flee in terror. By 23 March, artillery fire could be heard from inside the district. The next day, KMT Generalissimo Chiang Kai-shek flew to the front lines to inspect the defences, and left General Bai Chongxi there to help Li Zongren. The Battle of Tai'erzhuang had begun. The Grand Canal ran along Tai’erzhuang's southern border, just outside its southern gate. Following the canal south-eastwards would lead to Yangzhou (zh:扬州) and eventually the Yangtze River. Following it north-westwards would lead to Jining (zh:济宁) and eventually the Yellow River. The district was approximately 2km east of the Taizao railway line's northern station (台枣支线北站). Following the railway northwards would connect it to the Jinpu railway, while following it southwards would connect it to the Longhai railway via Zhaodun. To the northeast of the district was the Taiwei Highway which connected with the Jiaoji railway at Wei County (zh:潍县). Thus, Tai’erzhuang carried significant economic importance in peacetime. In wartime, it served as the northern gateway to Xuzhou, and was a point that the Japanese had to pass if they wanted to continue advancing southwards. Chi Fengcheng, commander of the Chinese 31st Division, positioned his 184th Regiment (led by Wang Zhen (zh:王震) inside the district itself. He deployed his 182nd Regiment to the west, at the northern railway station, while the 183rd and 181st Regiments respectively guarded the western and southern areas outside the district. Chi positioned his divisional command post at the southern railway station, which was on the southern bank of the Grand Canal. On 25 March, the Japanese launched an all-out attack on Tai’erzhuang, with a 300-strong contingent successfully breaching the north-eastern gate. However, they were then forced into the Chenghuang temple. The Chinese then set fire to the temple, killing the entire Japanese force. The next day, the Japanese launched another assault through the breached gate. While they were again forced into the Chenghuang temple, the Chinese were unable to repeat the same tactic of burning the temple, since they had already burned everything that was flammable the previous day. The Japanese were thus able to use the temple as a base, from which they began to systematically clear the district block by block, launching at least seven attacks per day. In the house-to-house combat that followed, the Chinese struggled to hold the line in the face of vastly superior firepower. The Japanese eventually secured the eastern portion of the district, before also breaching the north-western corner from the outside and capturing the Wenchang Pavilion (文昌阁). By this time, the district had been completely reduced to ruins, with not a single house left intact. The other three Chinese regiments fiercely fought the Japanese on the district's outer approaches, each expending six to seven thousand rounds of ammunition daily. These defensive actions on the outskirts were vital to preventing the Japanese from expanding the breach and annihilating the single Chinese regiment inside the district. Bai Chongxi had arrived at Tai’erzhuang on the same day as the initial Japanese attack, and quickly realised that the Chinese position would be untenable without additional firepower. Thus, he redeployed the Central Army's 8th Artillery Regiment to aid in the defence, and also borrowed a number of anti-tank guns from the 1st War Area. The anti-tank guns arrived on 27 March and immediately went into action at the district's outskirts: at noon the Chinese battery engaged a Japanese squadron of nine tanks, knocking out five of them. The Chinese troops in the trenches cheered enthusiastically before scrambling out to swarm the Japanese tanks. Stunned, the Japanese did not open fire for an entire five minutes. 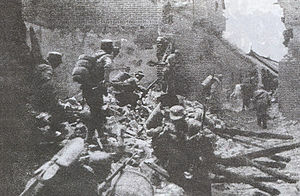 On 29 March, a small band of Japanese soldiers tunnelled under Tai'erzhuang's walls in an attempt to take the district from within. They were caught by the Nationalist defenders and killed. On the same day, Wang Zhen (CO of the Chinese 184th Regiment) was wounded in street fighting, and was replaced by Wang Guanwu (zh:王冠五). The acting CO formed a 72-strong assault team in commemoration of the 27th anniversary of the Second Guangzhou Uprising and its 72 Martyrs. Setting out from the south of the district, the assault team stormed the Wenchang pavilion from the south and east, annihilating the entire Japanese garrison with the exception of four Japanese troops taken as POWs. The Chinese had thus retaken the north-western corner of the district. Of the 72 Chinese soldiers, 14 were killed in action. During this time, Sun Lianzhong's 30th Division, 27th Division, and Wu Pengju's independent 44th brigade had assembled at Tai’erzhuang's outer approaches, respectively positioning themselves as the western, south-western, and eastern outskirts of the district. A unit form Yunnan, Lu Han (zh:卢汉)’s 60th Corps also arrived at the 5th War Area, and was incorporated into Sun Lianzhong's 2nd Army Group's order of battle. It consisted of the 182nd, 183rd, and 184th Divisions. While the 31st Division continued to defend Taierzhuang and its surrounding areas, the aforementioned units launched simultaneous attacks on the Japanese north of the district, seeking to relieve to the pressure on the 31st Division. The 30th Division, 27th Division, and 44th Brigade respectively attacked Nanluo) zh:南洛) from the southwest, Sanlizhuang (zh:三里庄) from the south, and Liujiahu (zh:刘家湖) from the east. The 60th Corps also joined the attack. However, the Japanese rushed in their 10th and 63rd Infantry Regiments southwards from Yi County to bolster their position, repelling the Chinese attacks and forcing them to withdraw to their original positions. It was during this time that the Japanese 5th Division also drove south-westwards from Linyi. Led by the Sakamoto detachment, it overran Xiangcheng[disambiguation needed] (zh:向城) before also capturing Aiqu (zh:爱曲). When 31st Division commander Chi Fengcheng was relayed this order from Sun, he ordered the demolition of the temporary bridge over the grand canal, which was his division's only retreat route from Tai’erzhuang. Chi was determined to fight to the last man and defend the district until death. Li Zongren's strategy now completely relied on the ability of Tang Enbo's 20th Army Group to manoeuvre around the Japanese to cut off their supply lines, block their retreat paths, and form a counter-encirclement to surround and destroy them from the inside and outside simultaneously. From the outset of the battle, the 20th Army Group had been conducting offensive operations northwest of Tai’erzhuang, with the 85th and 52nd Corps engaging the eastern flanks of the Japanese 10th Division's rear positions at Zaozhuang and Yi County respectively. By 31 March, the Chinese 52nd Corps had already fought its way to the outskirts of Beiluo (zh:北洛). However, with the Japanese 5th Division capturing Xiangcheng during this time, Tang Enbo decided to adjust his strategy. He manoeuvred his 52nd and 85th Corps eastwards to Lufang[disambiguation needed] (zh:鲁坊) and Daliangbi (zh:大良壁) respectively, with the 85th Corp's 4th Division holding at Lanling (zh: 兰陵), just south of Aiqu, thus forming a defensive line stretching from Lanling to Liujiahu, and from Liujiahu to Lufang. Additionally, overconfidence had led the Japanese commanders to overlook the thousands of inconspicuous "farmers" in the area, who were affiliated with Li Zongren and cut communication lines and supplies, diverted streams, and wrecked rail lines. By late March, supplies and fuels were being dropped from airplanes to Japanese troops, but the quantity was insufficient. On 1 April, the Japanese 5th Division's Sakamoto detachment rushed towards Chahe[disambiguation needed] (zh:岔河), with the aim of joining forces with the 10th Division at Tai’erzhuang's perimeter. Tang Enbo gave the Japanese free passage along Taiwei highway, luring them into his trap. With ten days of continuous fighting inside Tai’erzhuang having resulted in extremely heavy casualties on both sides, the Japanese tried to break the stalemate by unleashing poison gas on the entrenched Chinese defenders in an attempt to dislodge them. Nonetheless, the Chinese continued to stubbornly hold onto the district. The 52nd Corps would set out from Lanling, driving westwards to attack Yi County. The 85th Corps would set out from Daliangbi, also driving westwards to attack Yi County. The 75h Corps (which had recently arrived in the region and was led by Zhou Yan (zh: 周碞)), would set out from Chahe and manoeuvre north-westerly around the Japanese eastern flank to arrive at Zhanglou (zh:张楼), in order to cover the 52nd and 85th Corps’ manoeuvres. On the same day, the Chinese 2nd Army Group also launched a counter-offensive, with the 30th and 110th Divisions fighting northwards into Beiluo and Nigou (zh: 泥沟) respectively. On 6 April, the Chinese 85th and 52nd Corps linked up at Taodun (zh: 陶墩), just west of Lanling. The combined force then drove north-westwards, capturing Ganlugou (zh:甘露沟). With the various Chinese counter-attacks all accomplishing their objectives, the Japanese line finally collapsed, and both the 10th and 5th Divisions were forced to retreat. However, vastly superior mobility allowed the Japanese to prevent a complete rout by the pursuing Chinese forces. 2. Despite repeatedly deploying heavy artillery, air strikes, and gas attacks, the Japanese were unable to force the Chinese 2nd Army Group from Tai’erzhuang and its surrounding regions, even as the defenders risked complete annihilation. 3. The Japanese failed to prevent the Chinese 20th Army Group's manoeuvre around their rear positions, which cut off their retreat routes and gave the Chinese the advantage of a counter-encirclement. 4. Following Han Fuju's insubordination and subsequent execution, the Chinese military's high command rigorously adjusted the tone at the top by clamping down on military discipline, which pervaded down throughout the ranks and resulted in even the most junior soldiers willing to risk their lives in the course of carrying out their orders. For example, a "dare to die corps" was effectively used against Japanese units. They used swords and wore suicide vests made out of grenades. Due to lack of anti-armor weaponry, suicide bombing was also used against the Japanese. Chinese troops strapped explosives like grenade packs or dynamite to their bodies and threw themselves under Japanese tanks to blow them up. Dynamite and grenades were strapped on by Chinese troops who rushed at Japanese tanks and blew themselves up. During one incident at Tai’erzhuang, Chinese suicide bombers obliterated four Japanese tanks with grenade bundles. The defeat was a significant blow to the Japanese military. Being the first major Japanese defeat since the beginning of the war, the battle broke the myth of Imperial Japanese military invincibility, and resulted in an incalculable benefit to Chinese morale. Amid the celebrations of the victory in Hankou and other Chinese cities, Japan initially denied their defeat and ridiculed the reports of the battle for days. It was reported in the foreign newspapers, however. The battle also resulted in significant casualties and losses for the Japanese. The Japanese claim they suffered a total 11, 918 casualties, while the Chinese claim to have annihilated 24,000 Japanese troops in addition to knocking out some 30 tanks. The Chinese also took 719 Japanese troops as POW, and captured large quantities of military supplies, including 31 artillery pieces, 11 armored cars, 8 armored fighting vehicles, 1,000 machine guns and 10,000 rifles. Furthermore, the battle became an important symbol of Chinese unity, since the various Chinese units that participated in the campaign were all from a myriad of different cliques, which had been at war with each other merely seven years ago. In particular, the North-western Army, which had played a significant role in fighting Chiang Kai-shek's loyalist forces as part of the anti-Chiang coalition, played a pivotal role in this campaign. Furthermore, Li Zongren and Bai Chongxi, whom Chiang Kai-shek had previously labelled as rogues and expelled from the KMT for life, took a leading role in commanding the battle. Thirdly, the successful defence bought the Chinese time to withdraw government staff, refugees, factories, and resources in the lower reaches of the Yangtze River westwards from the war areas via Hankou, thus playing a pivotal role in supporting the overall Chinese resistance strategy. ^ Fenby, Jonathan (2003). Generalissimo: Chiang Kai-shek and the China He Lost (illustrated ed.). Simon and Schuster. p. 319. ISBN 978-0743231442. Retrieved 24 April 2014. ^ Fenby, Jonathan (2009). Chiang Kai Shek: China's Generalissimo and the Nation He Lost. Da Capo Press. p. 319. ISBN 978-0786739844. Retrieved 24 April 2014. ^ Fenby, Jonathan (2008). Modern China: the fall and rise of a great power, 1850 to the present. Ecco. p. 284. ISBN 978-0061661167. Retrieved 24 April 2014. ^ Li, Leslie (1992). Bittersweet. C.E. Tuttle. p. 234. ISBN 978-0804817776. Retrieved 24 April 2014. ^ Gao, James Z. (2009). Historical Dictionary of Modern China (1800-1949). Volume 25 of Historical Dictionaries of Ancient Civilizations and Historical Eras (illustrated ed.). Scarecrow Press. p. 350. ISBN 978-0810863088. Retrieved 24 April 2014. ^ Fenby, Jonathan (2010). The General: Charles De Gaulle and the France He Saved. Simon and Schuster. p. 319. ISBN 978-0857200679. Retrieved 24 April 2014. ^ 网易. "台儿庄巷战:长官电令有敢退过河者 杀无赦_网易军事". 网易军事 (in Chinese). Retrieved 2019-02-02. ^ Schaedler, Luc (Autumn 2007). Angry Monk: Reflections on Tibet: Literary, Historical, and Oral Sources for a Documentary Film (PDF) (PhD Thesis). University of Zurich, Faculty of Arts. p. 518. Archived from the original (PDF) on 2014-07-19. Retrieved 24 April 2014. ^ Olsen, Lance (2012). Taierzhuang 1938 – Stalingrad 1942. Numistamp. Clear Mind Publishing. ISBN 978-0-9838435-9-7. Retrieved 24 April 2014. ^ Dr Ong Siew Chey (2011). China Condensed: 5,000 Years of History & Culture (reprint ed.). Marshall Cavendish International Asia Pte Ltd. p. 79. ISBN 978-9814312998. Retrieved April 24, 2014. ^ International Press Correspondence, Volume 18. Richard Neumann. 1938. p. 447. Retrieved 24 April 2014. ^ Epstein, Israel (1939). The people's war. V. Gollancz. p. 172. Retrieved 24 April 2014. Axis History Forum Index » WW2 in the Pacific & Asia » The Sino-Japanese War(Campaigns in detail) See Pg. 1-2 for narrative, maps, order of battle and discussion of this battle. This page was last edited on 14 April 2019, at 03:35 (UTC).